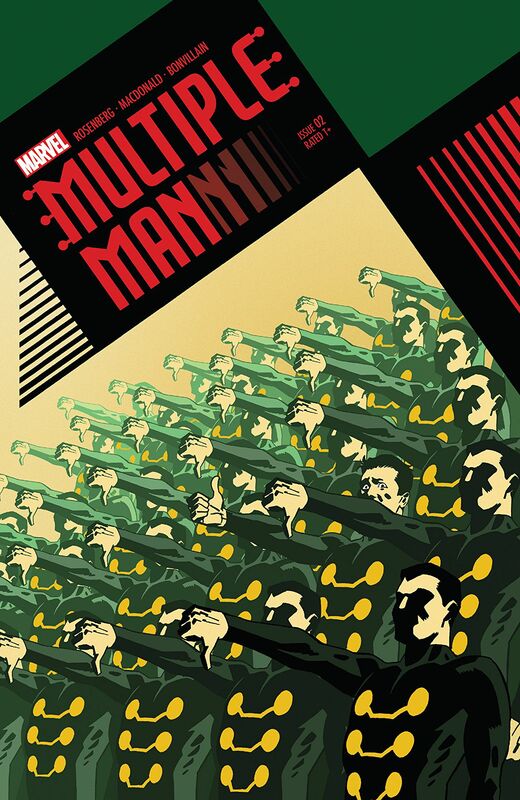 Multiple Man #2 picks up where the previous issue left off… with the last remaining dupe of Jamie Madrox confronted by a team of four Jamies from the far future: a Deadpool/Wolverine Jamie, a Cable/Warlock Jamie, a Doctor Strange/Cloak Jamie, and a Hulk Jamie. They need to bring him back to the future because when he went there last issue looking for a cure for his dupism, he somehow caused everything to go all apocalyptic. The five Jamies head back to 15 years in the future to set things right. There, we discover that surviving dupe Jamie messed things up with his time travel and somehow caused his future self to take over the world, which he rules as emperor with an army of evil fascist dupe police. It doesn’t take long for surviving Jamie and his companions to get into a tussle with a bunch of those dupes and kill them all. The dupes follow a young kid they saved to the headquarters of The Resistance, which is staffed by the past versions of surviving dupe Jamie’s current dupe companions, who themselves are from the far future past this timeline. Here, they don’t have other superheroes’ powers yet. Staying with us so far? Okay. So the resistance is led by a 15-year-old kid named Davey and the sarcastic severed head of Forge living inside a robot body. When Layla Miller barges in on Jamie while he’s taking a shower, she reveals that Davey is her son with the original Jamie, and by the way she wasn’t a big fan of Death of X either. Also, surviving dupe Jamie never knew Layla Miller because he went into the bunker before the original Jamie met her, which dates surviving dupe Jamie to before House of M. My god, this Jamie missed the peak Bendis years! Jamie takes a walk to process all of this and so the book can show off some Days of Future Past-style wanted posters showing dead heroes and also so we can walk watch some evil dupe police shooting people in a firing line. Jamie returns home to find Forge icing a cake. He gives Forge Bishop’s time travel device and asks him to make copies of it. Soon after, the dupe police arrive, and Jamie encourages the Resistance to fight them. In the ensuing battle, Hulk Jamie explodes. Surviving dupe Jamie realizes he screwed up and we’ll learn more next issue. This story is very silly. Over-the-top silly. Now that Matthew Rosenberg has finally landed that core X-title, has he spiraled out of control with ego, writing whatever he pleases, with no X-editor able to reign him in, and dragging Andy MacDonald, Tamra Bonvillain, and Travis Lanham down with him?! Hashtag #NoLongerMattyFromTheBlock? Well, whatever this team is smoking, we’d like to get our hands on some, because all the nonsense is exactly what makes the overcomplicated time travel stuff work.